Nearly 20 years after the debut of the Twenty-4 manchette watch that became a paragon of timeless feminine elegance, the Genevan manufacture is fulfilling a wish expressed by many discerning style-conscious women. To them, it is dedicating the all-new Twenty~4 Automatic, the first model of the collection with a self-winding mechanical movement in a round case. This highly contemporary watch was created to accompany eclectic and vibrant lifestyles around the clock, glistening with the fire of genuine diamonds. It is available in stainless steel or rose gold with dials of various colors. 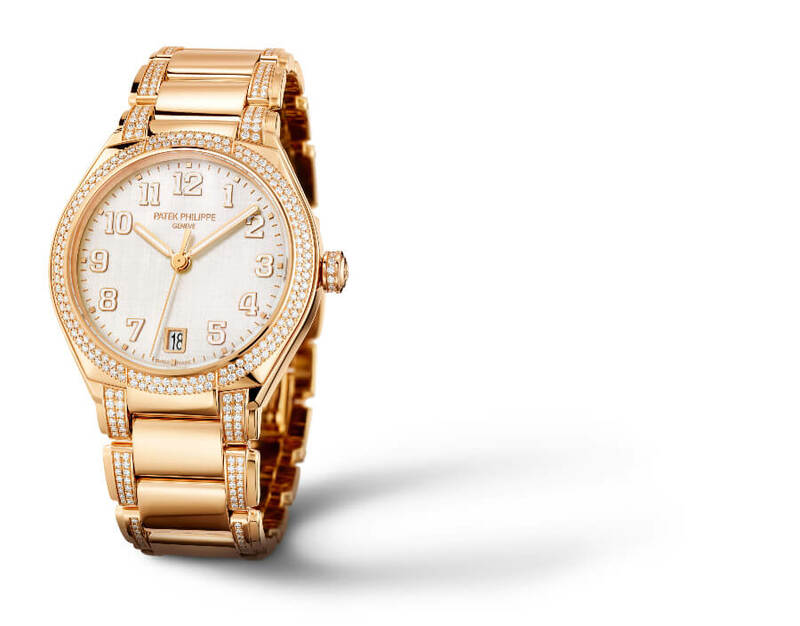 Since the company was founded in 1839, Patek Philippe has devoted much attention to its feminine clientele. With its pocket and pendant watches, lavishly decorated with refined artisanal techniques, the brand won the hearts of sophisticated female customers, among them Queen Victoria who had purchased a timepiece in blue enamel in 1851.The manufacture also leveraged its creative skills with a host of complicated ladies’ watches, including precious minute repeaters. 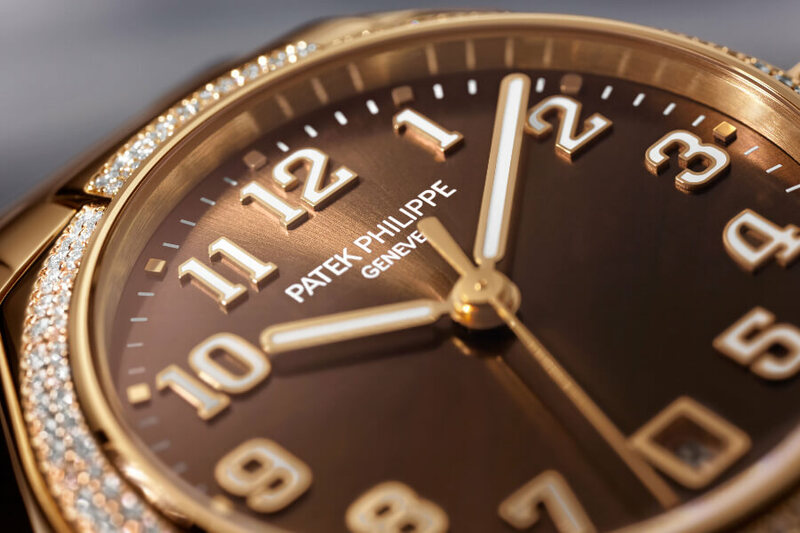 In 1868, Patek Philippe crafted the first Swiss-made wristwatch for a Hungarian countess. The manufacture’s first strike work wristwatch in 1916 was a ladies’ timepiece with a five-minute repeater. A growing demand for wristwatches during the art deco epoch gave the brand an opportunity to demonstrate its affinity with female tastes by crafting countless models with different shapes and decorations. 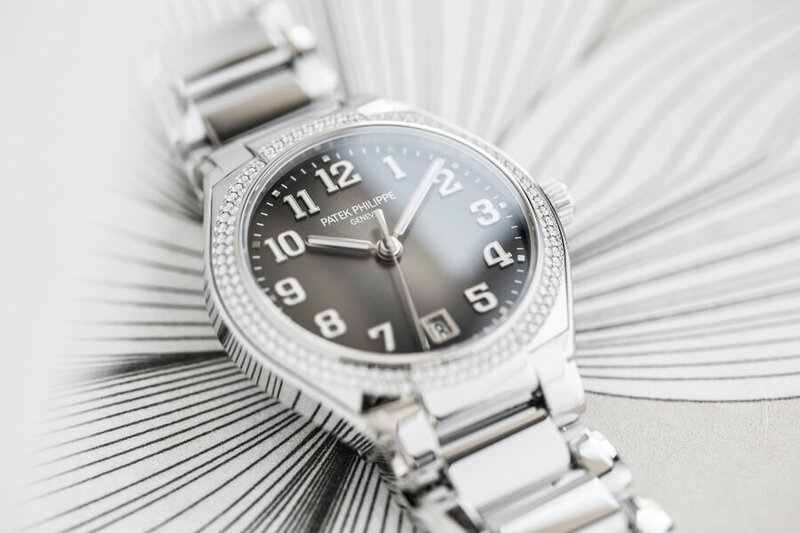 In 1999, Patek Philippe responded to the expectations of a young, dynamic generation with the very feminine Twenty-4 that became resoundingly successful. Its unusual name reflects the fact that it was a perfect companion for any time of day or night.The manchette watch was endowed with a quartz movement (except the 2003 Haute Joaillerie model with a manually wound mechanical movement); it came in various stainless steel versions and in gold as well. The manufacture also anticipated the growing interest among women in mechanical timepieces by developing various complicated mechanical ladies’ watches such as the moon-phase model or theLadies First Chronograph (2009). This selection was enriched with the AnnualCalendar for ladies, the grand complications such as the Ladies First Minute Repeater, Calatrava watches in jewelry and Haute Joaillerie versions as well as the feminine interpretations of the manufacture’s casually elegant classics –the Nautilus Dames and the Aquanaut Luce. 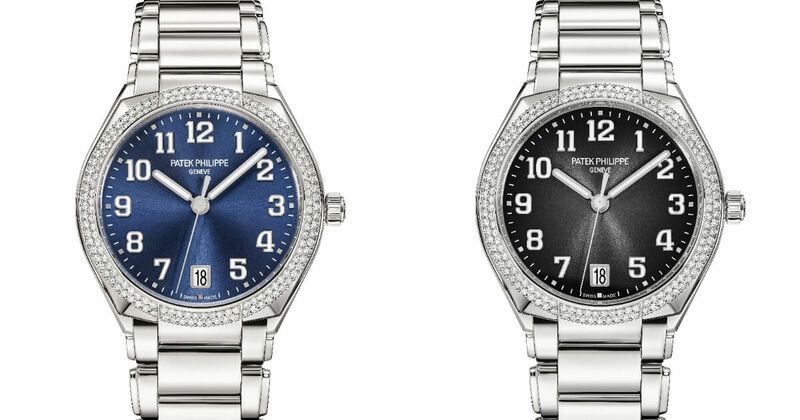 Patek Philippe is reinforcing its position in the growing segment of mechanical ladies’ watches and now presents a new self-winding wristwatch: the Twenty-4 Automatic. 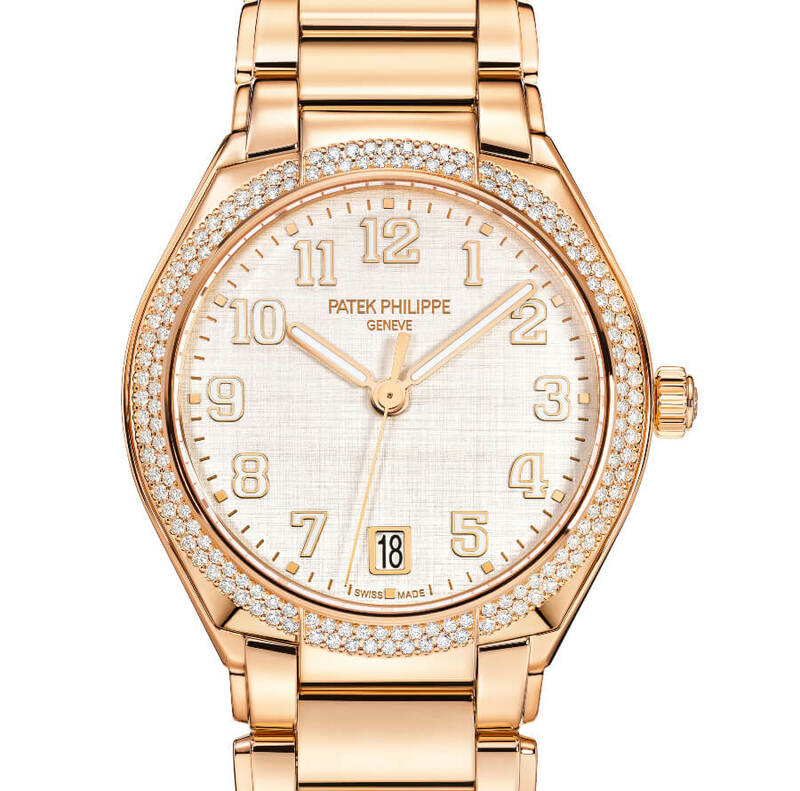 It is a timepiece for modern, self-confident women with taste who are decision-makers and pursue active lifestyles. With its sleek elegance, it is a watch for anytime of day, complementing every facet of daily life (work, family, private and social engagements, leisure). It perfectly matches the entire spectrum of a lady’s wardrobe – from outdoor outfits to evening gowns. The watch focuses on the woman who consummately handles latest-generation technology but prefers a mechanical timepiece on her wrist, one that represents a grand tradition of quality and the lasting value of an artistically crafted masterpiece. 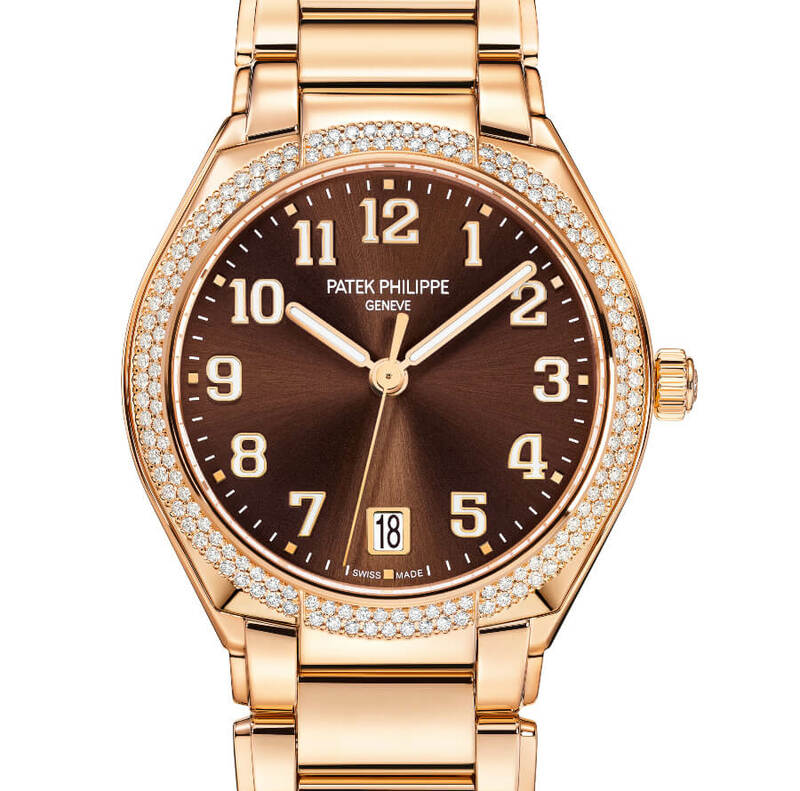 The caliber 324 S C was Patek Philippe’s choice as the heart of the new feminine model. 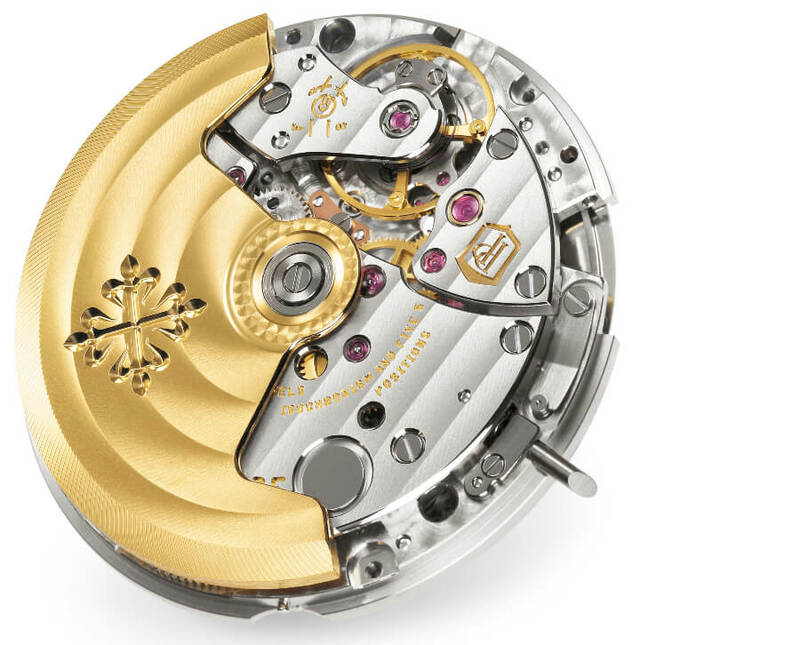 This self-winding movement with a Spiromax balance spring in Silinvar is a gem of precision and dependability. 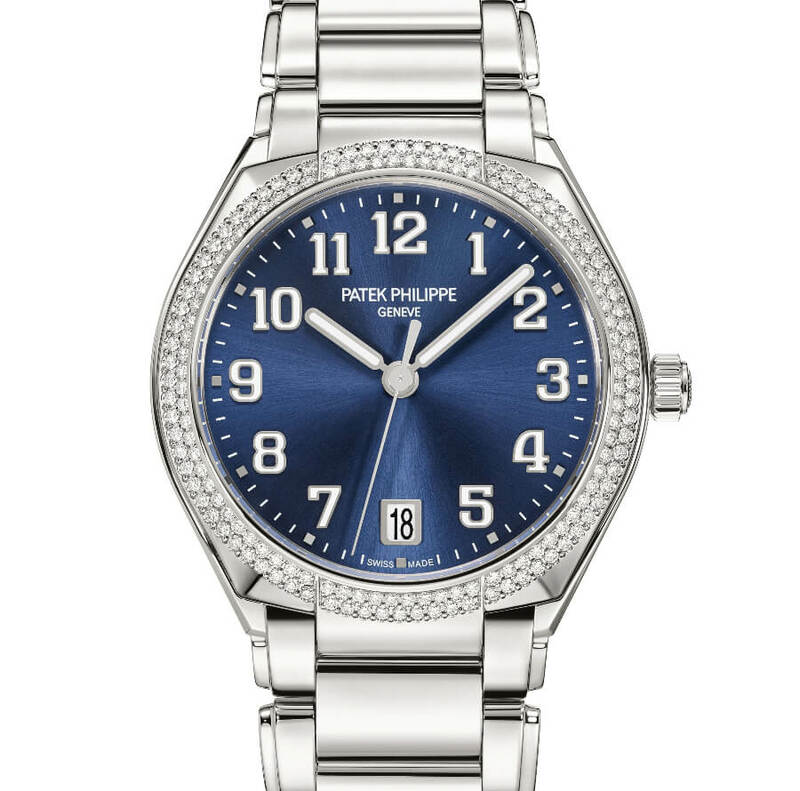 It is crafted to the strict standards of the Patek Philippe Seal and exhibits elaborate manual finissage (such as chamfered and polished edges and Geneva striping) that can be admired through the sapphire-crystal case back. Launched in Milan during a major international event on October 10 and 11, 2018, the Twenty~4 Automatic is supported by a dedicated advertising campaign with an extensive presence in digital channels. The new Twenty-4Automatic adopts the aesthetic appeal of the rectangular Twenty-4 with an exclusive bracelet featuring gently cambered central links framed by delicate two-tier outside links. With a supple fit, inimitable and elegant, it gently hugs the wrist. The self-winding version stands out with a totally new round case (36 mm in diameter) featuring prominent yet subtle contours. And as always in Patek Philippe creations, puristic style melds with highly refined details. An example: the beveled, diamond-set bezel is an elaborate construction that echoes the profile of the central bracelet links at 12 and 6 o'clock, emphasizing the harmony of the overall design. This precious ensemble is crafted in the manufacture’s ateliers and complies with all of the craftsmanship standards prescribed by the Patek Philippe Seal. The case and bezel are cold-formed in high-tonnage presses and then carefully machined tore fine the contours. 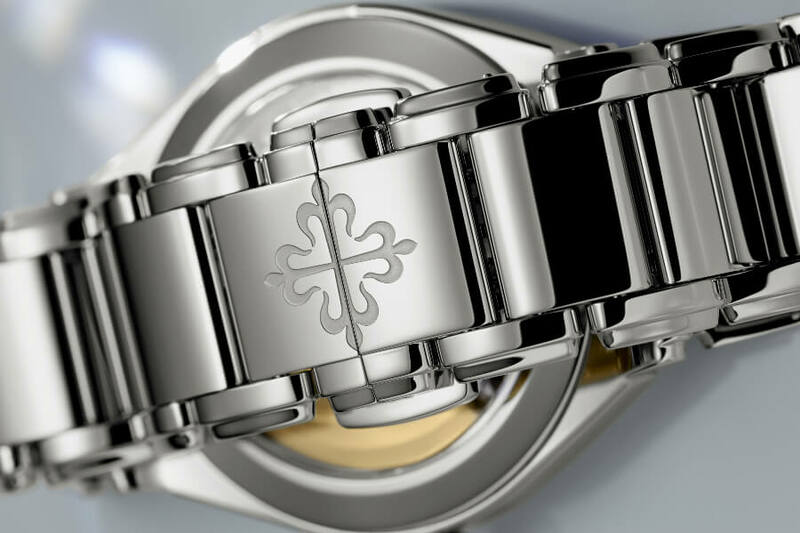 Afterwards, they are manually polished by experts with years of experience, an extremely demanding task given the complex forms especially in the bracelet lug zones. The dials exhibit assertive personalities. They are uncluttered and readily legible, with applied Arabic numerals in gold as well as baton hands with rounded ends and luminous coatings. The slightly domed sapphire-crystal glass underscores the sculpted profile of the case. The Twenty-4Automatic is available in five versions: two in steel with diamond-set bezels, two in rose gold with diamond-set bezels, and one in rose gold with diamonds set in the bezel, the bracelet, and the crown. The “Dentelle” (lacework style) gem setting technique produces two-row configurations of offset precious stones that highlight their radiance. 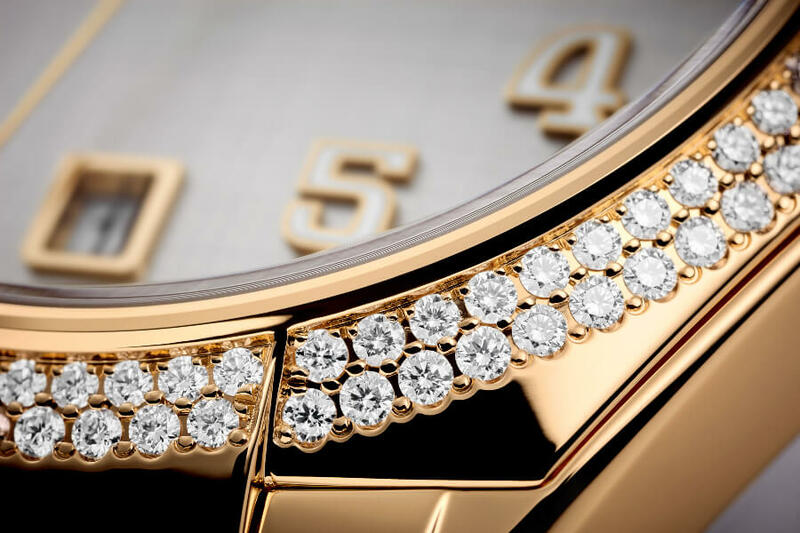 All diamonds – immaculately cut flawless Top Wesselton grade – comply with the directives of the Patek Philippe Seal and are set to the most exacting jewelers’ standards. 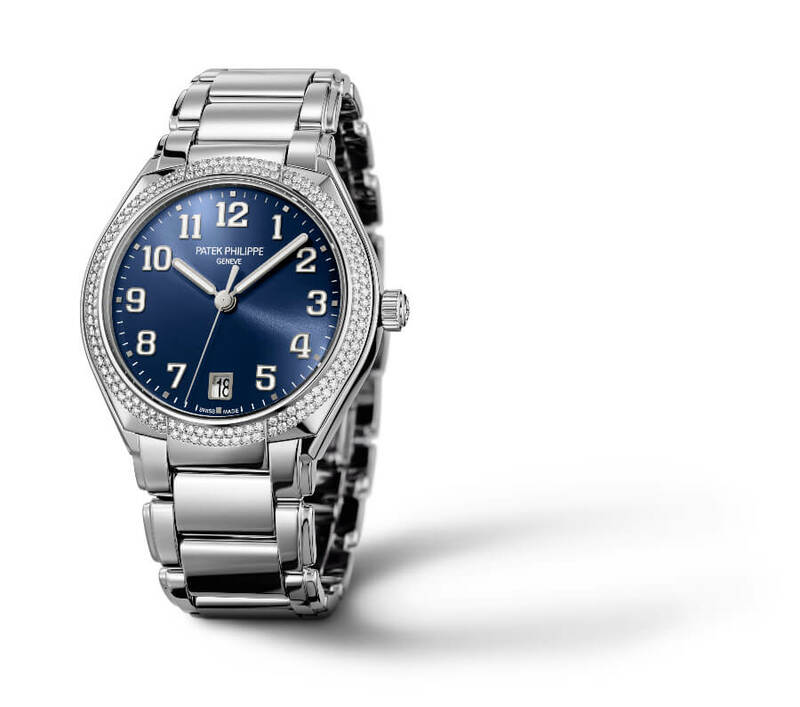 The version in stainles ssteel comes in two dial colors that endow each model with its very own characteristic style: sunburst blue (Ref. 7300/1200A-001) or sunburst gray, delicately gradated from the center (Ref. 7300/1200A-010). The rose-gold watches are also available in two color combinations: a sunburst chocolate brown and gradated dial (Ref. 7300/1200R-001) or a silvery gray dial graced with an exclusive double horizontal and vertical satin finish that is reminiscent of precious wild Shantung silk (Ref. 7300/1200R-010). 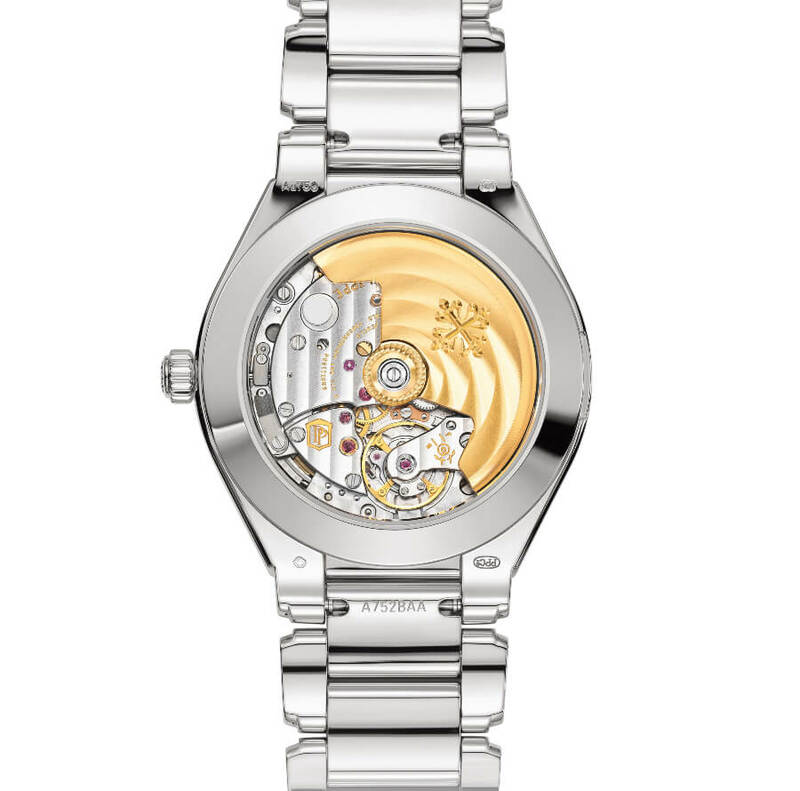 The Ref.7300/1201R-001 is for ladies who prefer a “dressier” watch. It is lavishly adorned with 469 diamonds for a total of about 1.88 ct, including the crown, the lugs, and the outer links of the bracelet. The dial stands out with its silvery Shantung finish. All bracelets are fitted with a new patented fold-over clasp (Patent EP3162241B1) that is dependably functional, very comfortable, and aesthetically pleasing. · Stainles ssteel or 18K rose gold or 18K rose gold with 248 flawless Top Wesselton brilliant-cut diamonds (~0.81 ct) on the outer links with new patented fold-over clasp (Patent EP3162241B1). · The system has four independent catches for optimized opening and closing reliability and prevents the accidental release of either of its two latches. For more information visit Patek Phillipe Online.